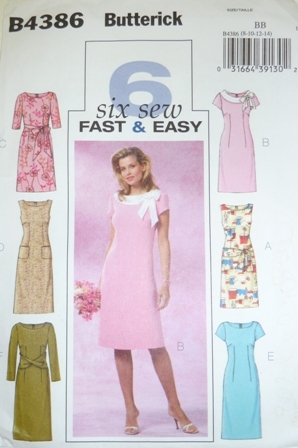 Simplicity Pattern 4070 was made by one of my sewing students Emily. It was a great success and I recommend making this pattern for yourself or someone you know. In today’s video I show you Emily’s dress, the special designer touch Emily added to make it unique, as well as which fabrics are suitable for the Simplicity Pattern 4070. Emily did a wonderful job sewing this beautiful dress from Simplicity Pattern 4070 in my sewing school here at Rosewood Cottage. Well done Emily! 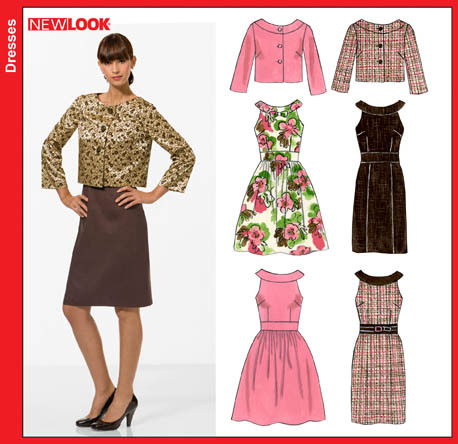 Have you made this Simplicity 4070 Dress Pattern as well? How did you find it? Or are you inspired to make it? In today’s sewing video I share a beautiful dress made by one of my sewing students Emily. Watch it now (click below) to get inspiration and insight from what is being made in my Sewing School Geelong Rosewood Cottage. 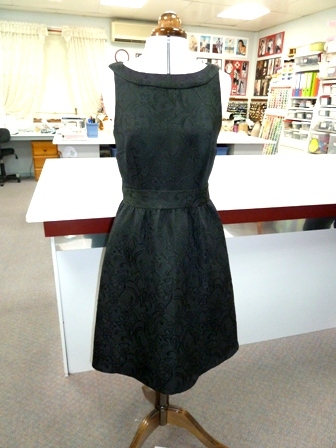 Emily made her dress from New Look Pattern 6799 – View B (pink dress above) from a beautiful black brocade fabric. It features a fully lined bodice, faced collar, scooped armholes, darts on the bustline, a midriff panel and a softly gathered skirt. It also has a center back zip and two pearl buttons on the back neckline. What do you think of Emily’s dress? Have you made this pattern or are now inspired to make it yourself? We would be delighted to hear from you so please leave a comment below. Before you go, we would also love to see the beautiful sewing projects you have made this year. Please come on over to our Facebook Page CLICK HERE and post your gorgeous creations and check out what other sewers have made too! We would love you to join our community! One of my student’s Anna was invited to a wedding and wanted to make a beautiful new dress for the occasion. 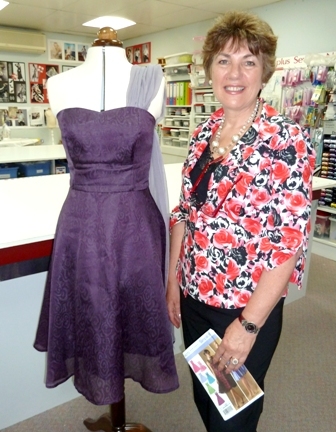 She purchased a gorgeous piece of lace and we transformed a simple Butterick dress pattern B4386 into a designer after five! What I loved most about this dress was playing with the pieces of lace to get just the right look we were after. Watch today’s video below where I share with you details about the pattern, fabric chosen and the sewing features! P.S. Make sure you watch to the end where you will see my special sewing helper! Have you made this pattern or have been inspired to try it yourself? We would love to hear your comments below!